Hello from Wales in the UK! Casting Virgin here. 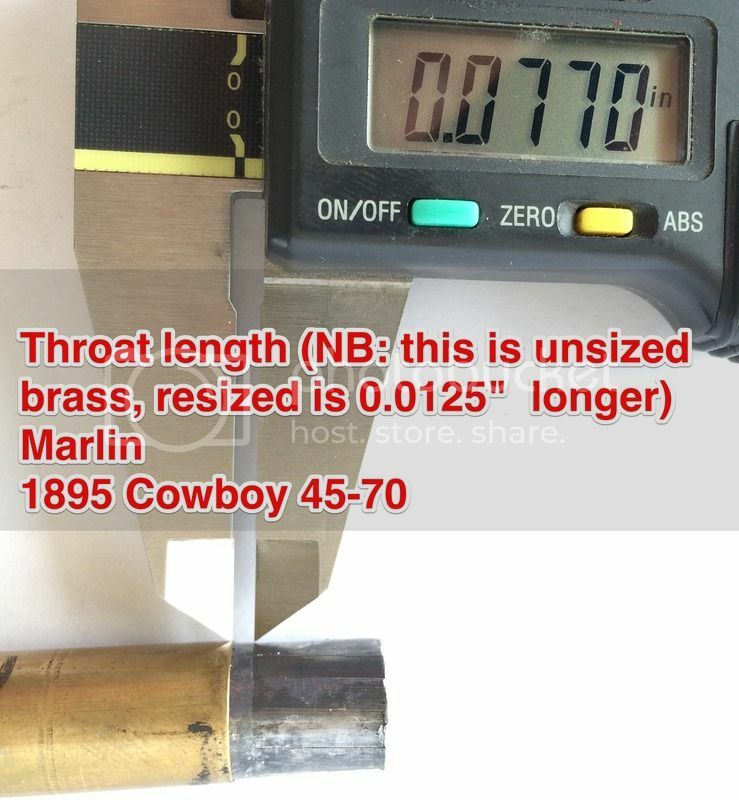 Initially, I want to cast bullets for my 45-70 Marlin 1895 Cowboy (2009 year of birth, JM stamped). I've been using bought cast 405gr bullets, trying to work out what it likes. 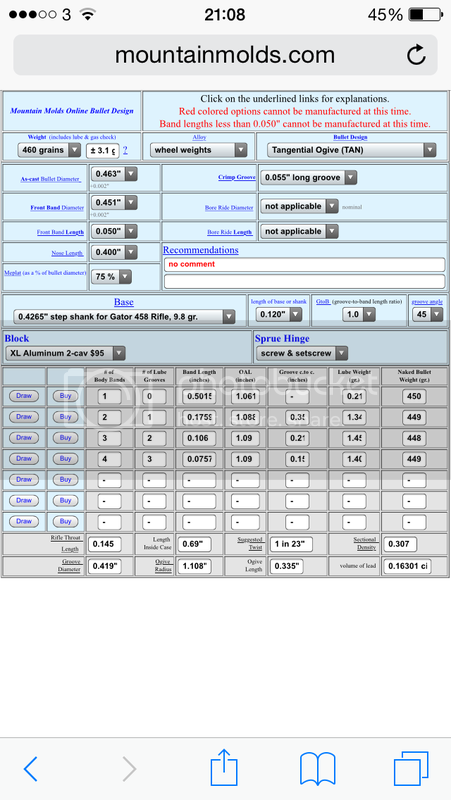 It shoots .462 (unsized) 405 gr bullets better than the otherwise identical .458 (sized) bullets from the same mold. What this tells me, I'm not sure. I had a go at slugging the bore (melted some lead in a metal pot and poured into the barrel, 2-3 inches from the muzzle.) 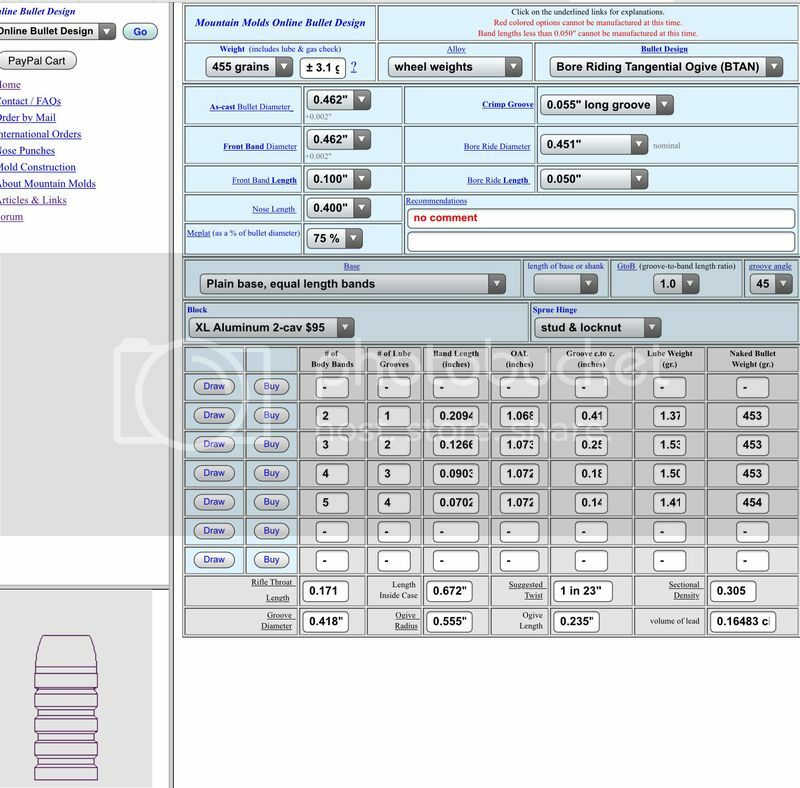 The slug measured 0.4545 across the grooves/widest-point averages (which seems small, so maybe I did something wrong). I'd already tried the .462 bullet successfully, so was puzzled. I'm trying to design a mold to produce a hunting bullet with a sectional density over 3 (so probably 455gr or so) and a large meplat of around .350" (approx. 75% of bullet diameter) that will feed and chamber in my Marlin. I don't know whether to go for a gas-check base or plain. I chose .462 based on what the gun has shot so far, though by that argument, perhaps I should go for .463 and size down to .462? I realise there is probably not enough data here for you to offer firm advice. If it makes a big difference, I will have a go at reverse-slugging or casting my chamber, though I'm a bit apprehensive about this. Marlins have SAAMI chambers. The only thing worth measuring is the distance between the case mouth and the rifling. Make sure your front band will fit in that space, and err on the side of reliable chambering. Marlins have been known to have constrictions in their barrels, so I would not be surprised if you have a 0.4545" tight spot. Many people firelap their Marlins to remove these constrictions. I'm not a big fan of firelapping, but there are exceptions to every rule, and Marlin lever guns are one of those exceptions. I prefer ladling myself, using either an RCBS or Lyman ladle. My ladles have the orifice drilled out to #21 or thereabouts. Many thanks for your reply. I'll try and get that measurement before finalising the design. I also think I'll go for a gas-check base. How do I know whether to opt for stud/locknut or screw/set screw for the spruce hinge? Pros of screw & setscrew: nothing in the way when removed, easily replaced if damaged. Cons of screw & setscrew: may need to be retightened from time to time while casting. Please note, this is using fired/unsized brass which is 0.0125" SHORTER than my resized brass. 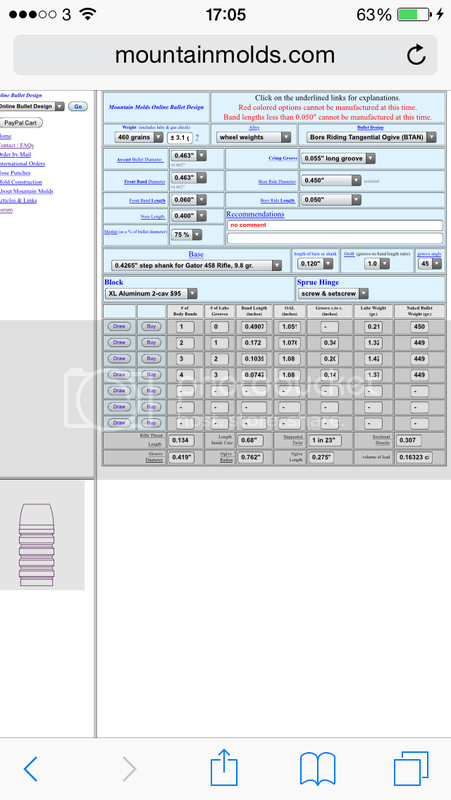 I assume that since I'll be reloading resized brass, I need to subtract 0.0125 from the 0.0770" I measured above, ie. 0.0645"
Do I have to use BTAN in this gun or can I use TAN? How do I choose the dimensions (diameter and length of bore ride)? 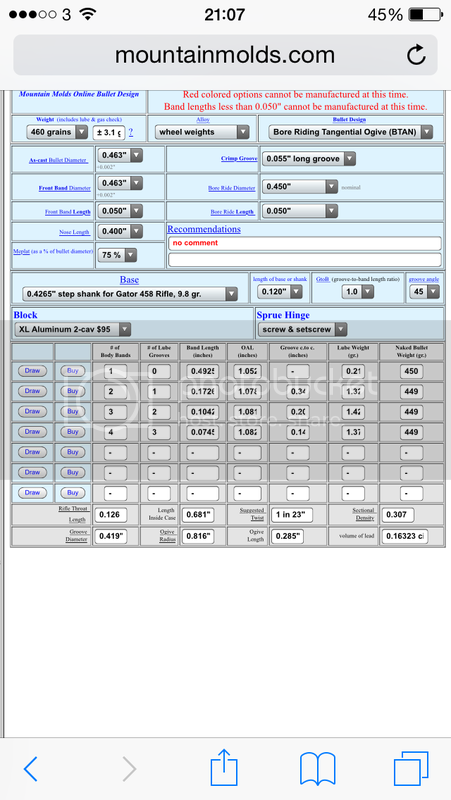 I've selected stepped gas check base, using 458 Gator 9.8gr gas checks, though I have no idea if this is right?! If it will work, I'd prefer the TAN (no lip/step to catch). Please let me know if you think this will work and if so I'll get on and order. Good job on the throat impression. Looks like you have a typical SAAMI 45/70 throat, which is to say no throat to speak of. A full diameter tangent ogive would NOT chamber in your rifle. I would go with BTAN, and make the front band 0.050" long. Bear in mind the crimp groove adds about 0.015" to how far the front band extends beyond the case, i.e. 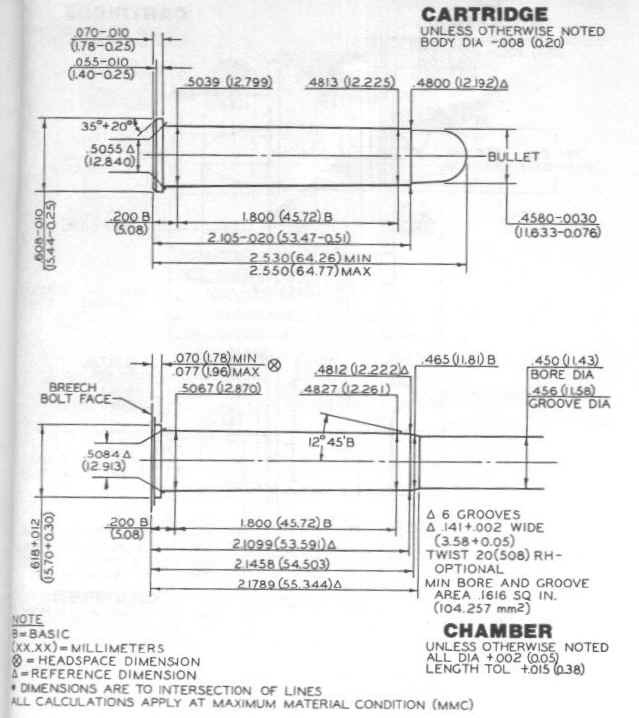 a 0.050" long front band will actually stick out about 0.065" past the case neck. If you are worried about the step on the nose, you could go with a tangent design but make the front band diameter 0.450" or 0.451" instead of 0.463". The only way to determine the bore diameter is to measure it. When in doubt, stick with 0.450" for reliable chambering. It's not critical that the nose engrave for this application because the nose is short relative to the caliber. 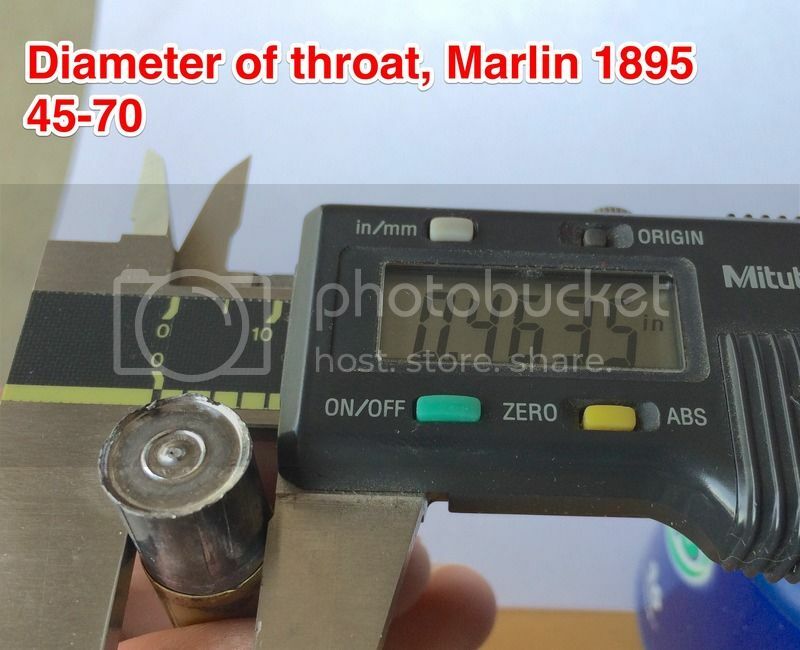 BTW, I'm going to move this thread to the lever action forum because other Marlin owners will be interested in your throat impression. Re: gas checks. Are Gator checks available in Wales? If you can get Gator 0.458" checks, that would work better because they are big enough to crimp on. If you can't get Gator checks, then Hornady 45 checks would work, but won't crimp on in a 0.463" sizer. They'll still shot fine, though. Note there is a slight difference in shank diameter for Gator 458 vs Hornady 45. The 458 Gator gas checks don't seem widely available here but I dare say I could track some down or get them sent from USA. I wouldn't want to compromise if the .452 are inferior. Hopefully ITAR restrictions won't block export! If you think the BTAN is the safer option, that's what I'll go for. Yes, those are your two options. If you go with the 0.451" diameter front band, you could make it longer if you wished. 3 or 4 bands, your choice. Bands that are about 0.100" long fill out easier than smaller bands. I am not sure whether there is a difference in how they shoot. You should be able to place an order to the UK online. If there is a problem let me know.